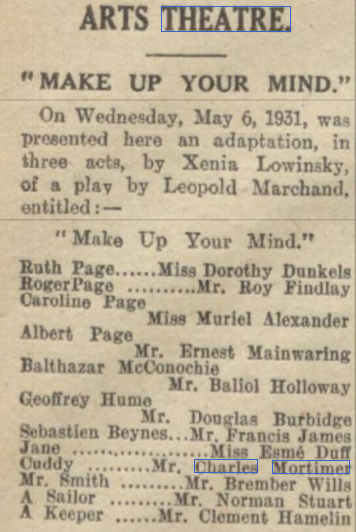 Charles Mortimer was in the cast of "Make Up Your Mind", playing Cuddy, at the Criterion Theatre, London, 1931. The play had also been at the Arts Theatre, from 6 - 10 May. From The Scotsman 6 November, 1931. "Make Up Your Mind" [ FROM OUR LONDON DRAMATIC CRITIC ] London , Thursday Night. Although the introduction of the element of abnormality usually weakens an ordinary play, this effect is perhaps less pronounced in farce, where the characters are in any event expected to behave oddly. Thus there is nothing amiss in the fact that the principal character in "Make Up Your Mind", the new farce at the Criterion , turns out to be a madman . He was no less a person than the millionaire , MacConachy, whose wealth was such that he was the only taxpayer left who still thought that Snowden was the name of a mountain in Wales. He intrudes into a peaceful household, fascinates the members with his wealth, and plays havoc with their lives , and generally provides much amusement for the audience, until the second act when he is as it were certified . After that the humour loses its flavour , for there is nothing about the declared insanity. The play, which is by Mr Leopold Marchand , and has been adapted by Xenia Lowinsky, has many bright lines . Nevertheless , Mr Baliol Holloway as the millionaire is very amusing until the eminent mental specialist pronounces upon his case. From the Era of 13 May, 1931. Farce, by Leopold Marchand. Adapted by Xenia Lowansky. Produced Arts Theatre Wednesday. May 6. 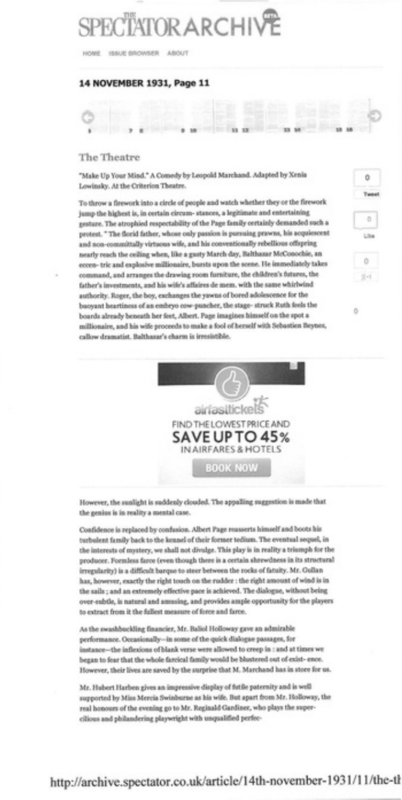 The play opens with the Page family in that state of vague dissatisfaction common to middle-class households. There are father with limited income which he is incapable of increasing, and a youngish step-mother with a potential lover, a young French playwright, whom she cannot bring herself to accept. There area daughter with theatrical ambitions which her father will not let her realize, and son apparently with ambitions whatever, and an uncle who is, but longer wants to be, in the Navy.